Here is a Roadside Peek tribute to another of the roadside's special treasures of the road. 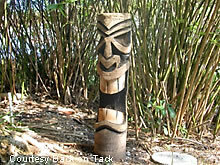 In this day and age, it seems like many of the tiki roadside treasures are falling by the wayside. 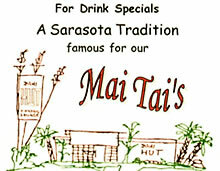 This article features the Bahi Hut of Sarasota, Florida. Many thanks to Steve from Back on Tack for both the text and photographs. Finding Tiki bars in Florida is not a difficult task. Just about every kiosk with a thatched roof, bamboo framework and toucan oil painting claims to be one. However, when looking for authentic, Polynesian influenced watering holes, the choices are not as prevalent as one might imagine. Let it be noted that I in no way pretend to be a scholar on the subject of Tiki. Frankly, I could not tell a Moai from a mower, nor do I really care. Those looking for a detailed history on the subject will find plenty of authors ready to cash in on the resurgent chic. To me, the journey has always been about finding a roadside hangout that descends time and holds a certain charm, but most of all is just plain fun to be a part of. 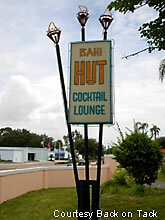 The Bahi Hut in Sarasota, Florida, goes beyond the criteria. My traveling companion Kimberly and I rolled into the Hut at about 6:30 one Saturday evening. Before we can even open the door all the way by its massive wooden spoon handle, Larry greets us. "Come on in, you'll love it," Larry says a little sloppy from his Happy Hour binge. "Danny will take care of ya. He is a good guy." One can't help but notice what a remarkable resemblance Larry bears to Burt Reynolds. Inside the Bahi Hut, nicknamed the Bye Bye H, are all the quintessential details of an authentic Tiki bar. A U-shaped serving area extends out from the back wall. Above it, stretches bamboo anchored shelves with various types of liquors and small-carved statues. Opposite the bar is an intimate table seating area leading up to a glass wall. Outside the window, canopy palm trees shade a Tiki statue carved from a protruding stump. A beautifully sketched Hawaiian girl hangs by the front door and music from a local 80s radio station sets the tone. "What'll it be," Danny asks. "I'll try the world famous..." He finishes my sentence with "Mai Tai." Danny looks to Kimberly as he pours a mixture from a plastic jug over ice and shakes. He can tell she is indecisive. "You may not like these," he tells her as he slaps my drink down on a beige cocktail napkin with a crude drawing of the place. They were purchased in bulk back in the 1960s, and although the drinks never stop, the napkin supply never seems to decrease. "There are seven different types of rum in there," Danny tells me after my first sip. "The receipt is a secret, but I can tell you we use all natural juices. No grenadine! We only allow you to have two." Danny hobbles around the bar with a limp due to a sprained ankle. He explains that after a couple of Mai Tais the previous week, his foot slipped into a hole outside the bar. Those Florida sinkholes will get you every time. Kimberly finally decides on a Sneaky Tiki, which is a much sweater version of the Mai Tai. Before long, Larry returns to his bar stool and he and Danny begin a friendly banter about hairpieces. During their exchanges we learn how our hospitable bartender is a 27-year-veteran of the Bahi and at one time was a professional baseball player. There is a curly top bleach blonde with Larry who thinks Danny resembles a character from the movie "Boogie Nights." She starts to assign all the patrons in the bar bit parts and exclaims that she wants to be Roller Girl. "Well, you already got Burt," I joke. 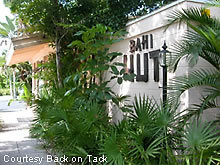 An older couple beside them comment about how little has changed at The Bahi since they first began frequenting it. "This place is the same as it was when it first opened in the 1950s," the silver-haired gentleman comments. "It's actually become fashionable again." "I don't know about that," Larry chimes in. As twilight turns to night, Larry and Roller Girl hop into their yellow Sebring convertible to seek out some food. Halfway into a second Sneaky Tiki, I realize I'm not driving home tonight and book a room at the neighboring Best Western. 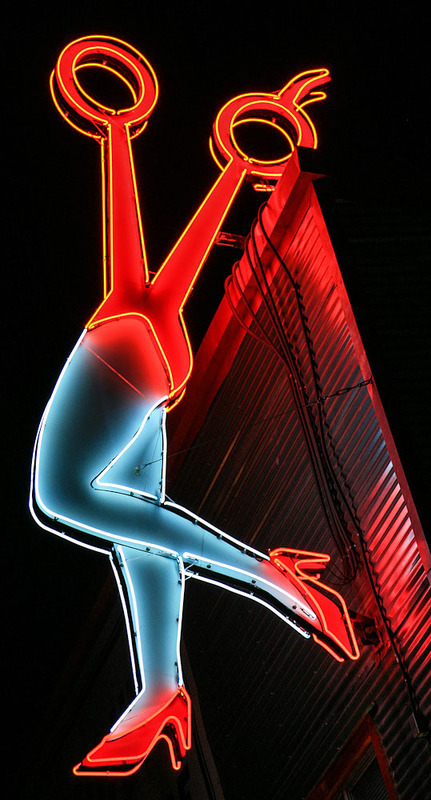 Danny hands his shift over to Tim, and the colored spotlights that surround the Tiki pole outside, pop on. Tim is a heavyset gentleman clad in high top sneakers and a Hawaiian print shirt on which his gray ponytail rests. He is also the bar's current owner. The rest of our evening is spent socializing with the natives as Tim keeps our glasses full and the conversation light. Danny has turned from pourer into patron and is singing the praises of Jim Morrison to anyone who will listen. Some of the people that come and go are tourists, but most are locals out to catch a weekend buzz. We head back to our room sometime after 11. By this time, a line of people has begun to snake from the front door to the backside of the Bye Bye. 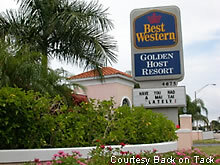 It would not be the last trip here. We would return on several occasions later and each time the bar staff would remember our faces. As they filled our drinks, they would fill us in on the latest news of the day. Most recently Danny relayed the story of a Tiki book author who had visited him. The gentleman apparently had more of an admiration for the Mai Kai in Fort Lauderdale. "He's telling me about these girls in bikinis that twirl fire and put on this show," Danny says rather disgusted. "Ah, you can have it. I like this place just the way it is." We agree. 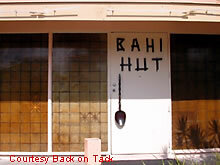 2004 will mark the 50th anniversary of the Bahi Hut and by all accounts, it shows no signs of slowing down.